A branching shrub with ascending or erect, leafy branches, 1 to 4 feet high. Leaves pinnate, leaflets five to seven, linear-oblong or oblanceolate, pointed at each end, one-half to 1 inch long, silky-pubescent, the margins entire and revolute; stipules membranous, ovate-lanceolate, entire and pointed. 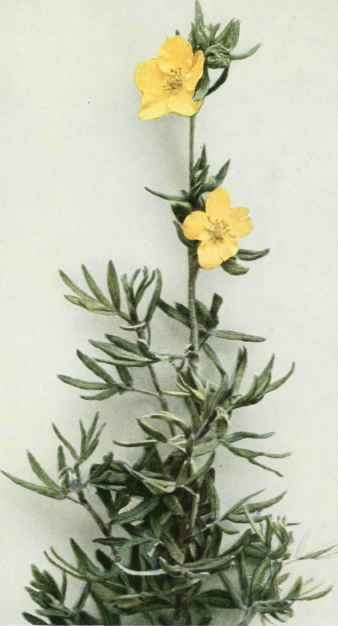 Flowers terminal, in dense or loose cymose clusters, or solitary, bright yellow, three-fourths to 1 ¼ inches broad; the five calyx lobes ovate, with five bractlets; petals five, nearly orbicular and longer than the calyx lobes. Achenes of the fruit covered with long straight hairs. In swampy or marshy places, often in moist rocky places, Labrador and Greenland to Alaska, south to New Jersey, Illinois, Minnesota, Rocky mountains and California; also in northern Europe and Asia. In northern New England it is often a troublesome, bushy weed. Flowering from June to September.